The weather lately has been windy and wet….lots of it! Every time things seem to settle down….here it comes again. It’s been tough getting anything done outside, especially fishing. I have had to cancel several charters due to conditions. So far, fall has not been kind to us on the Treasure Coast. We did get out a few days recently. The Michael Shields Memorial Inshore Tournament was held recently. Mike Burke and sons, Cameron and Rhys, were out with me for the tourney. Cameron and Rhys had a good morning catching lots of fish early in the day. Five year old Rhys caught the most fish that morning. The boys did catch a good number of trout and were able to turn in three for the tournament. The guys were real troopers and fishing the entire morning! 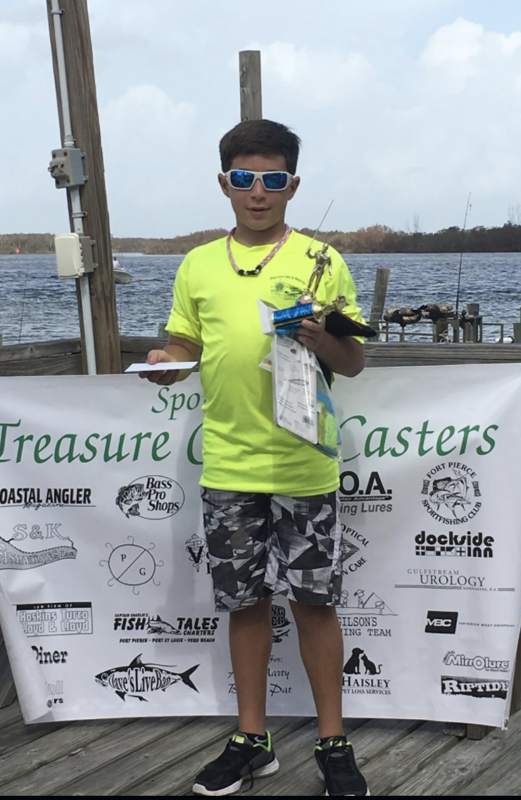 The October Treasure Coast Casters Tournament was also held recently. I had Michael and Nick on the boat. It was a tough morning to fish with windy conditions and dirty water everywhere. The boys caught fish, but it took all morning before we caught something on the fish list. Nick caught a nice mangrove snapper and it turned out to be the only fish weighed that morning. Nick won first place in Middle School Division and biggest fish. Water is still dirty and very high. It’s going to take a while to get cleaned up as long and the rains continue. Look for any cleaner water or where the water is moving for your best chances. There have been tarpon in the inlets and turning basin. Snook have been in the same places along with docks and bridges. The trout bite has been north of Fort Pierce around Harbor Branch. Snapper have been along channel edges and some good sized ones are in the river. Plan your trips wisely and have fun…when you can get out!